Otherworldly mischief from a larger-than-life personality. Ma didn’t believe in the afterlife. Even if there was no afterlife, as she claimed, Ma was coming to me in various forms from somewhere after she died. Maybe it was only the long echo of her life on earth reverberating in my own head. How else to explain the distinct sound of her growly voice barking out my name in her singular way? No one else said my name like that. What compelled her, or her spirit, to yell my name early one morning so that I leapt from my bed, disoriented, time-traveling back to panic-thinking I was late for school? As there was no earthly reason to yell in my ear, I can only assume it was sheer otherworldly mischief on Ma’s part, an echo of the childish part of her that liked to poke hornets’ nests, then stand back and act innocent when the screaming began. Or maybe it was a last tiny gift, the first note of the comic or tragic aria she used to deliver every time we spoke, depending on her mood. I missed the daily installments of the Ma radio hour, the family gossip, the neighborhood death tallies, the consoling, smothering, ever-present worry about me. On the one-month anniversary of her death, Ma sent a random older man to me in the pasta section at Trader Joe’s. As I pawed through the organic penne, I looked up to see him staring at me, a beatific smile cracking the wrinkles on his Santa face. “Your mother must be a beautiful woman,” he said. He turned and wafted down the aisle, vaporizing almost as quickly as the cool mist surrounding the frozen pork shu mai. By the time I realized he was complimenting me through my mother, it also dawned that Ma was commemorating her own one-month anniversary by reminding me she was once on earth, she was once considered good-looking, and if random people thought I was too, well, that was because of her. Or — and this was a distinct possibility — I could also be approaching the age where I was geezer bait. Ma could be reminding me of that, too. After Ma died, I asked my sister if I could have the charcoal drawing of our mother that had hung on the parlor wall forever. I had always loved that portrait. The child snob in me believed it made our family seem genteel. Looking at the portrait through adult eyes, it’s clear the sketch was probably dashed off for fun at a carnival. As a child, I loved the generic look of the portrait that softened Ma’s Mediterranean features into an American blur. 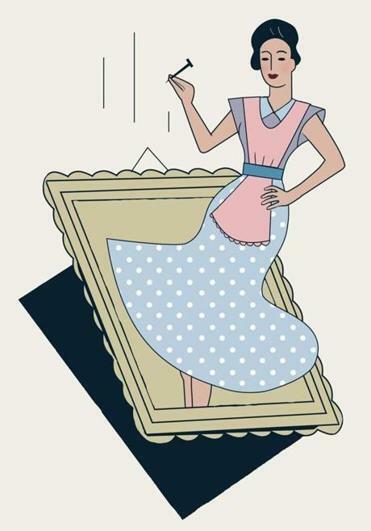 On our parlor wall, she looked like a housewife pushing brownie mix in a mid-century women’s magazine, like someone even-tempered and bland. Ma seems happy in the portrait, looking at life head-on, years away from the bitter persona that emerged when my father died. The morning after we agreed to transfer it to my house, my sister called, shaken. The charcoal portrait had crashed to the floor in the deep gloom before dawn. We both contemplated whatever force had hurled it there after so many years. Ma has been on my wall for almost 10 years now, secure in her new space. Her messages from the afterlife have dwindled in recent years. I wonder if she’s become subsumed into the cosmic goop, or, perhaps, like an actor sick of being typecast, she’s moved on to another role, another family, another life. If so, I get it, I really do. In my spotty acting career, I seem to specialize in playing bitter, alcoholic mothers. Or nuns. I get bored with the nuns, never the bitter alcoholics — but that’s my own karmic story. I hope Ma’s story continues somewhere and that she never yells in my ear again. Marianne Leone is at work on a book of essays called “Ma Speaks Up.” Send comments to connections@globe.com. ■ When glimpsing the train was important. Correction: This story has been updated to correct the illustration credit. The illustration was done by Orlando Hoetzel.